Mumbai, at it again, by sharing the first place on Thursday ! 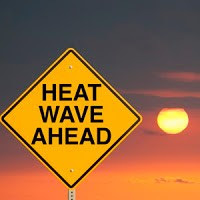 For Asia today, Thursday, 17th, Nawabshah (Pakistan), Mumbai, S'Cruz and Colaba, Prachin Buri (Thailand) share honours for the hottest place at 36c. Makkah (Arabia), Honavar and Ratnagiri (west coast, India) and Veraval (Coastal Gujarat) come a close second at 35c. N-3, a fresh W.D, predicted 4 days ago by vagaries and put up in the monthly forecast, is expected to precipitate rain/snow over Northern Pakistan on Friday, and move eastwards into Kashmir and H.P. from Saturday. It is hoped, that the effect of this W.D. will dislodge the anti cyclone over N/Central India, and change the winds from East (East winds are exepcted on Sunday) to NW. This pattern re-organisation should bring down the day temepratures in the Western India coastal regions from Tuesday (possibly a day earlier). Due to weak momentum and insufficient surface energy, BB-10 has failed to develop, and is stationed as a low at 1010 mb, off the T.N. coast. It has spread its clouding on to the T.N. coast. After all it is a system, though weak, and is expected to precipitate rain along the T.N. coast and interiors of the state during the week end. In fact, by Saturday, as the low dissipates on the shores, we can expect some heavy rains in some pockets along the coast. Chennai too can get some heavy showers by Sunday. New Evidence for Liquid Water on Europa…See Space News Page for more on this exciting breakthrough. Spate of Tornadoes roar across Southern states, causes damage, Alaska shiversTornadoes were reported in Louisiana, Mississippi and Alabama..See temperatures Map of Alsaka on International Page. acc to newspaper reports..min dipped to 20.6...so winter is coming then?